Manufacturer of a wide range of products which include sweeping brush, road cleaning brush, street sweeper brushes and floor brush. We have gained a remarkable position in the industry by offering a distinguished collection of Floor Sweeping Brush. 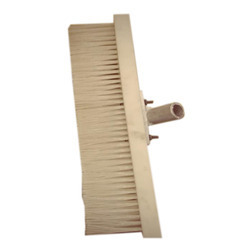 This brush is manufactured best quality material & modern technology in conformity with industry standards. The provided brush is appreciated in the industry due it's effective cleaning. Also, this brush is available in several sizes & other related options in a given time frame. Heavy Duty Nylon Block Nylon Fikament floor sweeping Brush. Alluminium Casted Clamp attached for rod Fitting.